Substantial evidence suggests that we are currently living at the peak of oil production with few prospects for cheap oil ever returning. Yet the media, politicians and regular people have hardly started to talk about what this means. Oil literally runs our societies from transportation to food production to economic activity. Without oil, everything stops. There are powerful arguments that if we fail to increase oil production, we will also fail to grow our economy as a whole. For oil importing western nations the news is bleak; higher oil prices seem to put a glass ceiling on their economic growth, making current debt problems worse no matter what monetary and economic policies we might choose. The World After Cheap Oil offers a thorough package of information about oil; its uses and its role in our society’s important sectors. It presents the most prominent substitutes and alternatives, and their limits and promises. 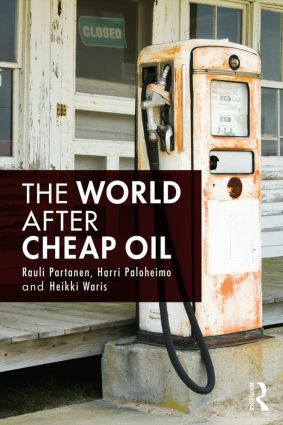 It also delves deep into the many risks, problems and mechanisms that can make the world after cheap oil a much more unstable place for nations and humanity as a whole. The book also explains why there has been so little public debate on the subject, and what the future might look like after oil production starts its final, terminal decline. Rauli Partanen - President and founder of Peak Oil Finland (a non-profit organization), independent writer, lecturer and consultant on the environment, energy, society, the economy and their interrelations. B.B.A. Harri Paloheimo - Founder of Peak Oil Finland; CEO and co-founder of Coreorient Ltd. developing crowdsourced deliveries; M.Sc. ; Phd student in Aalto University on transport energy efficiency; consultant for companies, cities and the Finnish Parliament in the areas of energy and transport. Heikki Waris - Founder of Peak Oil Finland; Co-founder of Coreorient Ltd. developing crowdsourced deliveries; M.Sc. ; consultant for companies, cities and the Finnish Parliament in the areas of energy and transport.